Mercedes Benz have never had a reputation for commercial vehicles. In recent times they have branched into this space with the Sprinter vans and the little brother the Vito vans. This move baffles us, consumers who want commercial vehicles are traditionally tradesman or companies that require the vehicles for goods deliveries. Stereotyping these kind of owners, they tend not to be the high income earners and often have little sympathy for a motor vehicle. These owners often regard a vehicle as a machine for doing a job as opposed to an asset that requires maintaining and for this reason we felt the commercial market was no place for the luxury car manufacturer, yet we were wrong. Consumers do seem to be buying up Sprinter vans and Vitos, granted they are replacing tyres as often as they are filling the thing up with diesel but for reasons that baffle, these commercial vehicles did sell. In the latest move, and in answer to the VW abomination that is the Amarok (view that article below) Mercedes Benz has entered the duel cab ute space with the launch of the X Type. The Mercedes is a suspicious partnership with Nissan. The platform for this vehicle is from the Nissan Navara that has a dubious reputation at best. However Mecedes has taken the lead pencil of Nissan and turned it into a beautiful fountain pen. And with this new flash pen comes a substantial price tag. For the money involved of landing yourself a X Type you could score yourself a Hilux, a Ford Ranger or even a secondhand Landcruiser. Mechanically at this stage we can’t fault the X Type, it is still too new to identify any common issues with them however the Achilles heal of this vehicle is the rear suspension. It would seem that for reasons unknown to us, the wise bearded men at Mercedes Benzs ditched the leaf spring rear end and went with coils, this makes for very average performance when towing substantial weight and lets face it, thats why your considering buying this ute. If its average at towing why would you pay close to 100K for it? Power wise the X Type is very impressive, all research carried out, suggests the Merc is probably the best performer across the whole rev range in its class. It maintains a good level of torque across the whole rev range and responds when you need it to. Like most european vehicles, it is pleasant to drive and comes with all the features. 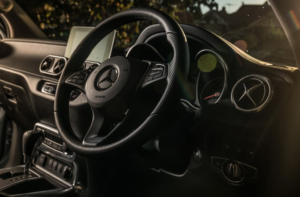 As with all European vehicles the cost of maintenance should also be considered, the Merc will cost close to double what a Japanese dual cab will cost on maintenance. We explain why in this article here. Why are European vehicles Expensive to maintain? Overall the X Type is not bad however the price tag that comes with badge bias is the ultimate deal breaker here. You are effectively looking at a glorified Nissan, with rear suspension that is no good for doing the one task this vehicle is actually made to do, tow heavy loads. If you don’t need to tow, want an overpriced dual cab that is beautiful to drive, comes with a prestige badge and lots of great options this is a suitable vehicle for you, its either this or the VW. My advice is buy the Merc or catch a bus. Otherwise, save yourself somewhere between 30 and 50 grand and look at a Japanese Dual cab ute.